Project Tube Box DS2 Valve Phono Stage in Silver. Available with Online Finance and Free Delivery. This precision tube phono preamplifier benefits from outstanding circuit technology from Dr. Sykora and uses ultimate components. Compatible with both MM and MC cartridges. 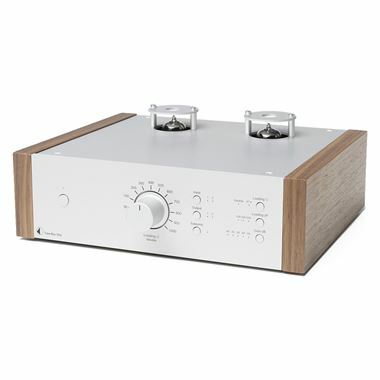 It offers connection for two turntables plus two selectable line outputs and a continuously variable selection of input impedance for low output MC cartridges while playing a record! Other features include input capacitance for MM cartridges and switchable subsonic, which helps prevent your amplifier and speakers producing ultra low rumble below 20Hz. All components including tube output and polypropylene capacitors are audiophile-grade and guarantee a breathtaking sound experience. A perfect upgrade for ambitious vinyl lovers!